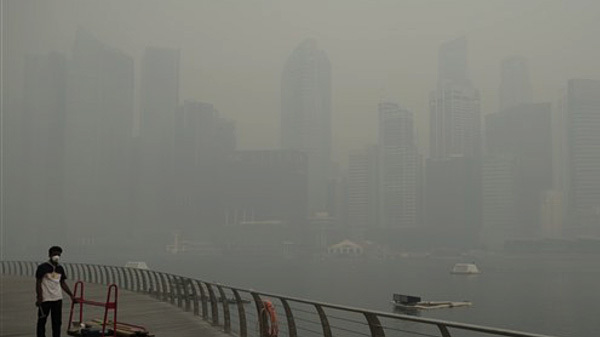 Singapore’s prime minister has warned that the haze engulfing the city-state could last for weeks, as air pollution soared to record levels. That does not sound good for Singapore. The haze, which is smog, comes from smoke produced by “slash and burn” cultivation from nearby Sumatra, Indonesia. This year, the smog has broken Singapore’s Pollutant Standards Index record by hitting 401 at noon on Friday—the highest in Singapore’s history. Anything over 300 is extremely hazardous and life threatening. Singapore’s previous record was 226 in 1997. Singaporeans lined up outside pharmacies for face masks only to find out that many had sold out. These particulate-filtering N95 respiratory masks block out 95% of airborne particles larger than 0.3 microns. These particles can travel through the lungs and enter the blood stream with fatal effects. 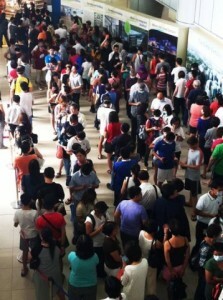 Those Singaporeans who can, are fleeing the country on impromptu vacations. However, health is not the only problem. The severe smog over Singapore could also hurt the city-state’s economy if it persists for weeks, according to economists. The pollution is hitting tourism-related industries in Singapore, which make up about 5% to 6% of the economy. Singapore welcomed 14.4 million visitors last year who generated SG$23 billion (US$18 billion) in revenues. The tourism sector contributed 4.0% directly to Singapore’s gross domestic product. Now, with the smog, tourist spots are shutting down as companies allow staff to work from home. Singapore restaurants are nearly deserted. Seletar Airport, which services the private jets of VIP guests, was forced to close due to “poor visibility caused by the haze,” authorities said. There are also reports of flight delays affecting Singapore’s Changi airport. Biswas noted that such a decline would come at a time when Singapore’s manufacturing sector, is hurting from weak orders from its main markets the United States and Europe. Singapore’s external trade has dropped my 1.4% in May 2013. According to Singapore, its national economy contracted by 0.6 per cent on a year-on-year basis in the first quarter of 2013. Currently, Singapore’s GDP is expected to grow only between 1% and 3% this year, historically low by Singapore standards. Singapore’s flooding is not just a health problem but an economic problem, as well. Airborne Particulate Matter and Mortality: Timescale Effects in Four US Cities. Am J Epidemiol. 2003; 157:1055-1065.
it’s bad, the Drs are the ones making money from the sick people, hope for rain. The haze is not the worst problem facing Singapore. He opined that more buildings had been built that created a heavy load on the land. At the same time, Singapore had constructed more subway systems and created more holes in the ground. “More buildings create a heavy load. Can the island withstand such heavy loads?” he asked. With Singapore’s huge population growth, there will be more heavy buildings to house them. Singapore is built on sand – sinking shifting sand!!! This is not dangerous.the most dangerous,if an earth quake at 9-10 mangitute shaken. the center gas pipe line lay in the center of the country, explode will caught the whole country in fire. Perhaps the most dangerous of all is the aqueduct which brings Singapore’s water from Malaysia. It is a narrow tube and exposed above-ground where anyone can see it. I have even walked on it! If the aqueduct is destroyed that is the end of Singapore. Economically, maybe the smog is the beginning of the end – at least of Singapore’s soaring real estate prices.